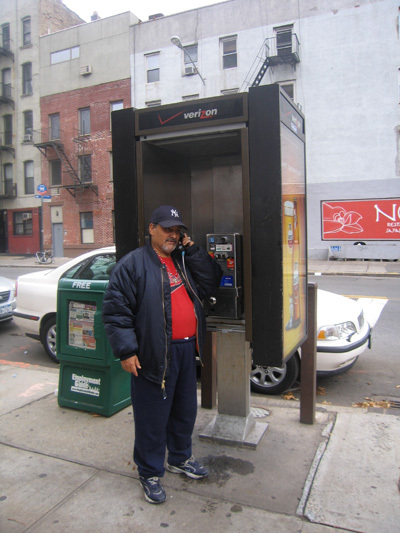 at public telephone cells in the East Village, N.Y.C. free103point9 is extremely pleased to announce Peter Stuyvesant’s Ghost (PSG), a collaborative public art and historic environmental project taking place in New York City November 15-19, 2006 and including local as well as Dutch artists contributing one-minute sound pieces. Ridgway’s contributions are excerpts from telephone conversations with people in the area with Dutch last names reflecting a patriarchal, genealogical mapping of ‘Dutchness’ in the area of Stuyvesant’s former farm. The most furthermost telephone cell to the east is at a bus stop, where one can hear a one-minute excerpt of Double Dutch Bus by Frankie Smith, 1981. PSG is a civic art project, inspired by the rapid cultural and physical changes engendered in the NYC area during the Dutch colonial period. 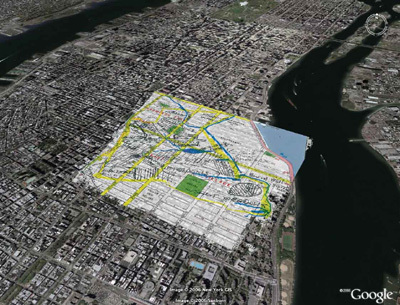 The last Dutch governor of NYC, Peter Stuyvesant had a farm which is now the East Village. Using new media and old, combining walking tours with internet-based telephony, creating maps that are drawn and maps that are heard, encouraging guided listening and focused seeing, PSG invites audiences to explore the contemporary streets while making palpable the pre-urban environment. The Telephone Tour is a self-guided walk, following routes provided in a map. Calls from cell or payphones to this number, 212-202-0637, will access a central open-source telephony server and a payphone will be available at all chosen points. After making the phone call, the participant will dial the message code indicated for that particular site, thereby accessing a short (no more than 1 minute) sound file. Soundtracks are archived at free103point9, a non-profit media arts organization focused on establishing and cultivating Transmission Arts. This genre includes experimental practices in radio art, video art, light sculpture, and installation and performance utilizing the electromagnetic spectrum.